Remedies for Alopecia Areata - Can Natural Treatments Help? About 4.6 million people in the United States struggle with alopecia areata, an autoimmune disorder that occurs when the immune system mistakenly attacks your hair follicles and, as a result, causes hair loss on the scalp and various parts of the body. While there is currently no cure for alopecia areata (and no medications approved for its treatment), some people turn to a range of natural treatments and remedies in an effort to control the condition. For a report published in the American Journal of Clinical Dermatology in 2010, scientists sized up the available research on the use of complementary and alternative remedies and therapies in the treatment of alopecia areata. However, in their analysis of the 13 studies selected for the review, the authors found that no study was well-designed enough to provide "robust evidence" of the benefit of any type of complementary and/or alternative approach in the management of this condition. A form of Panax ginseng, Korean red ginseng shows promise in the treatment of alopecia areata. In a preliminary study published in the Journal of Ginseng Research in 2012, scientists observed that Korean red ginseng may help promote hair growth in people with alopecia areata. A number of small studies indicate that hypnosis may be beneficial for people with alopecia areata. These include a study published in the International Journal of Clinical and Experimental Hypnosis in 2008, for which 28 people with alopecia areata received hypnotherapy. Of the 21 people who completed the study, 12 participants experienced significant hair growth after undergoing hypnosis. What's more, all study participants showed a significant decrease in anxiety and depression after receiving hypnotherapy. A study published in the Swedish journal Acta Dermato-Venereologica in 2011 also found that hypnosis may benefit people with alopecia areata. For this study, 21 people with alopecia areata received 10 sessions of hypnosis over a six-month period. By the study's end, participants showed improvements in several markers of psychological wellbeing, including anxiety and depression. Applying onion juice to parts of the head or body affected by alopecia areata may help promote hair growth, according to a small study published in the Journal of Dermatology in 2002. In an experiment involving 38 people with alopecia areata, those who used an onion-juice-based treatment twice daily for two months experienced significantly more hair growth compared to those assigned to a tap-water-based treatment for the same time period. In a small study published in Archives of Dermatology in 1998, an aromatherapy treatment involving a blend of essential oils of thyme, rosemary, lavender, and cedarwood appeared to aid in the treatment of alopecia areata for some people. For the study, 43 people with alopecia areata massaged a combination of these essential oils and the carrier oils jojoba and grapeseed into their scalps every day for seven months. Meanwhile, a second group of 41 people with alopecia areata massaged only jojoba and grapeseed oils into their scalp each day for the same time period. At the study's end, 19 members of the aromatherapy group showed improvement in their condition, while only six members of the second group showed improvement. In a preliminary study published in Acupuncture in Medicine in 2013, tests on mice demonstrated that electroacupuncture may inhibit certain alopecia-related changes in skin cells. Electroacupuncture is a form of acupuncture in which needles are attached to a device that produces continuous electric impulses, and then placed at specific points on the patient's body. 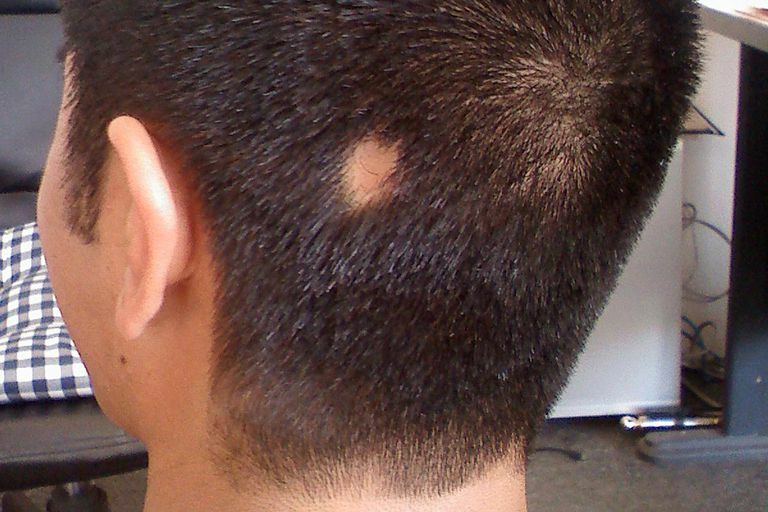 Stress may play an important role in triggering episodes of alopecia areata, according to a study published in the Journal of Dermatology in 1999. Although it's possible that practicing stress management techniques could offer some protection against episodes of alopecia areata, there's currently a lack of studies testing the use of such techniques in alopecia areata management. While further clinical trials are needed, certain holistic therapies or remedies may be helpful to some degree. If you're thinking of trying any type of natural treatment for alopecia areata, make sure to consult your healthcare provider first to weigh the pros and cons and discuss whether it's appropriate for you. García-Hernández MJ, Ruiz-Doblado S, Rodriguez-Pichardo A, Camacho F. Alopecia areata, stress and psychiatric disorders: a review. J Dermatol. 1999 Oct;26(10):625-32. Hay IC, Jamieson M, Ormerod AD. Randomized trial of aromatherapy. Successful treatment for alopecia areata. Arch Dermatol. 1998 Nov;134(11):1349-52. Maeda T, Taniguchi M, Matsuzaki S, Shingaki K, Kanazawa S, Miyata S. Anti-inflammatory effect of electroacupuncture in the C3H/HeJ mouse model of alopecia areata." Acupunct Med. 2013 Mar;31(1):117-9. Oh GN, Son SW. Efficacy of korean red ginseng in the treatment of alopecia areata. J Ginseng Res. 2012 Oct;36(4):391-5. Sharquie KE1, Al-Obaidi HK. Onion juice (Allium cepa L.), a new topical treatment for alopecia areata. J Dermatol. 2002 Jun;29(6):343-6.
van den Biggelaar FJ1, Smolders J, Jansen JF. Complementary and alternative medicine in alopecia areata. Am J Clin Dermatol. 2010;11(1):11-20.